Why did you major in Zoology as part of the Bachelor of Science? I’ve always loved animals. I was the kid who would bring home different stray animals and make my parents keep and look after them. I chose UQ because it is perfectly positioned, close to many zoological facilities, and Queensland offers so many natural beauties and opportunities. I enjoyed the well-rounded academic and field opportunities - getting hands-on is definitely beneficial. Meeting students of various backgrounds who all share the same passion and drive for a topic was great. The course material was excellent and there are many things I learnt during my degree that were and are still unknown by many people. The research done at UQ and the subsequent information passed down to students certainly provides them the step up into life and a career. It’s a great privilege to work with such majestic creatures, and I spend a lot of time just building relationships with them. I will feed them, exercise them, and then spend 2-3 hours per day on structured enrichment activities. 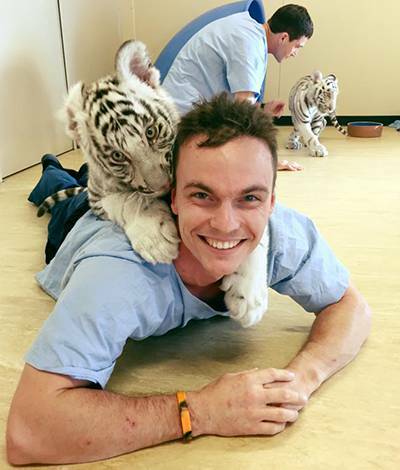 My team also spends a lot of time raising money for big cat conservation. So far, we’ve raised more than $2 million for the conservation of wild tigers around the globe. Definitely go ahead and choose UQ. I graduated and have obtained my dream job but I am also a current student as well. I returned to UQ to do a tourism management degree, and I wouldn’t choose any other uni.